The two-bedroom studio was advertised as 12.35m², and went on sale on the classifieds website Leboncoin. The price works out as €17,000 per square metre, considerably more than the area’s usual high of €12,000 per square metre. 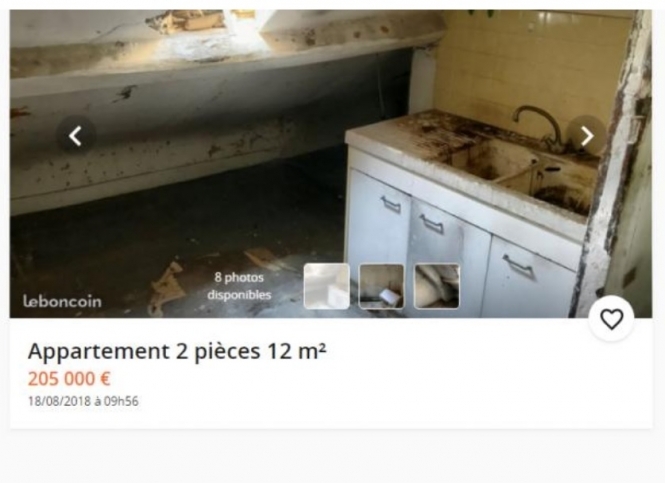 The ad clearly stated that the property is “three servants’ rooms that have been knocked together” and requires “total renovation”. Photos on the advertisement showed rusty plumbing, broken and dirty walls, low ceilings and exposed wiring. A video created by newspaper Le Figaro (below) shows more. In reality, the actual size of the apartment is slightly more than the advertised space - at 38.02m² of total floor space - but the 12.35m² figure corresponds to the amount of floor space that someone could stand up in: e.g. under a ceiling height of at least 1.8m. According to Le Figaro, two potential buyers have already come forward with an offer. The advert is no longer available on Leboncoin. It has not been confirmed whether a final buyer was found for the space.